Casters & Wheels for O.E.M. 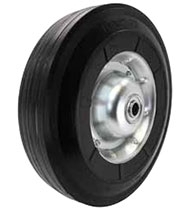 BC Semi Pneumatic on Metal Hub Hand Truck Wheel 10"x 2-3/4"
(not air filled) is mounted in a metal hub. Hub is bolted together to enhance the wheels weight capacity. Ball bearings are tack welded into the hub, for added strength and security. Offset hub for use on hand trucks, dollies, carts & mobile equipment such as pressure washers, compressors, generators, etc. Offers a shock absorbing cushioned ride, floor protection and quiet rolling operation. Excellent impact resistance & durability, will not flat spot. This wheel can leave tread marks. © Copyright 20165 Caster Corporation. All Rights Reserved.